ABUJA—SERVICE Chiefs on Thursday met with the Chief of Staff to the President, Abba Kyari at the Presidential Villa Abuja. 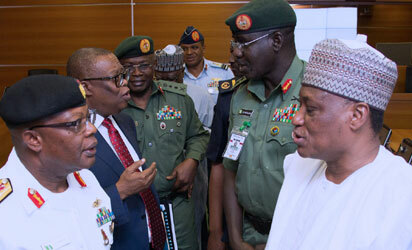 Minister of Defence, Brig Gen Mansur Dan-Ali, Chief of Army Staff, Lieutenant General Tukur Yusuf Buratai, Cheif of Defence Staff, Gen Abayomi Gabriel Olonisakin, National Intelligence Agency (NIA), Ayodele Oke and Chief of Naval Staff Rear Admiral Ibok-Ete Ekwe during a security meeting with Service Chiefs at the State House in Abuja. Though the agenda of the meeting was not made public, it may not be unconnected to the security situation in the country especially within this election period. It was gathered that the Service Chiefs first went to the office of the aide-de-camp ADC to the President before proceeding to see the Chief of Staff. The four Service Chiefs at the Villa were Chief of Defence Staff, Chief of Army Staff, Chief of Naval Staff and Chief of Air Staff.